The VWR Digital 3-D Rotator Waver offers you precise microprocessor control of wave motion with low foaming, in smooth three dimensional motion. This rotator rocker is compact enough to fit in incubators, cold rooms or by your side at a bench. This rotary mixer is an ideal choice for DNA extractions, blotting techniques, blood samples, and general mixing of various size tubes. This lab rocker orbits in the x, y and z axis, and lets users set speed tilt angle, and time from the up front LED control panel. The angle can even be adjusted while the unit is operating for on the fly corrections. The timer of this lab rocker with show either time elapsed, or will count down the user defined limit and, sound an alert and power down once it’s reaches zero. 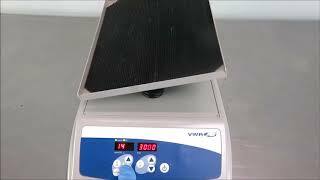 This VWR Digital 3-D Rotator Waver has been thoroughly inspected and reached its max speed and tilt easily. All of our lab equipment comes backed with our standard warranty. Should you have any questions, please don't hesitate to contact us.